Earlier this week, the euphoria over US high yield bonds hit new post-crisis highs when amid a sharp slowdown in supply, a rise in the oil price and generally solid economic conditions, insatiable buyers of junk sent the Bloomberg Barclays Corporate high yield spread to the lowest since before the financial crisis, dropping as low as 303bps, the tightest level since late 2007 before drifting somewhat wider during the late week bond rout. 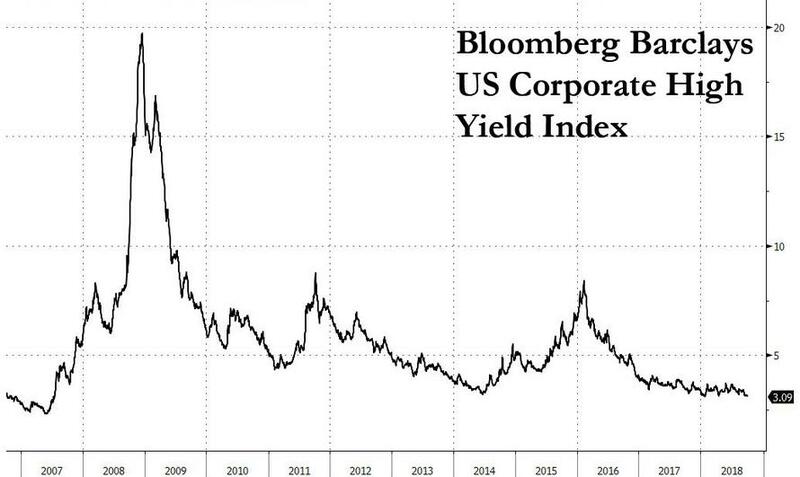 Yet while the US high yield market remains remarkably resilient in the face of sharply higher yields, the same can not be said of European junk bonds where the bubble may have finally burst. As Bank of America's Barnaby Martin writes in his latest research note, in stark contrast to shrinking US spreads, European high-yield spreads have blown out by 70bp wider, with total returns just +13bp, a far cry from the average annual returns of +11% observed over the last decade. 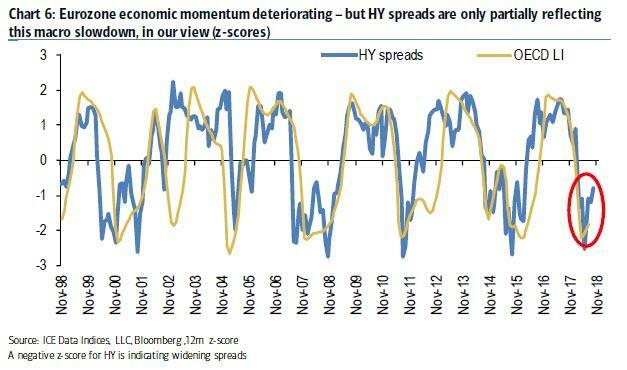 Putting this dramatic reversal in context, at the start of the year Euro HY spreads were 80bp tighter than US spreads. Now they are 35bp wider, in large part due to the deterioration in the Italian backdrop, concerns about the end of the ECB's QE and the recent deterioration in the European economy. 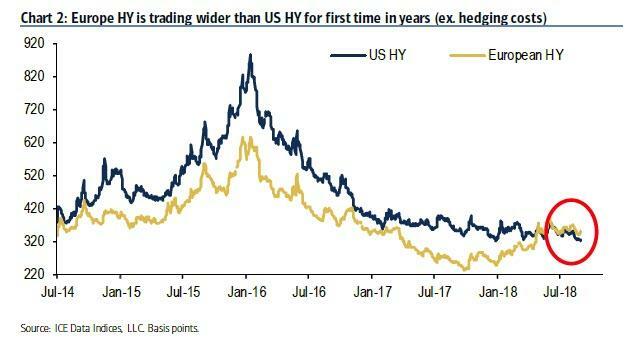 As Martin shows in the chart below, "one has to go back to late 2012 to find that last time that Euro HY spreads were this wide to US spreads." Also note the variance in quality: 41% of the US HY market is single-B versus just 24% in Europe. What has prompted this curious reversal in the fates of the European and US junk bond markets? According to Martin, a key theme for European risk assets in general is that Quantitative Tightening by the Fed has made simple "cash" in the US a competitive asset class again. We think this dynamic is likely to weigh on European high-yield spreads and also act as a barrier to meaningful retail inflows returning in Europe. This dynamic is laid out in the chart below, which shows the yield on European BBs versus the yield on US 6M Bills. Martin highlights that bill yields have acted as a "lower bound" to European high-yield spreads this year (the US Dollar has also been rising since mid-April ’18). 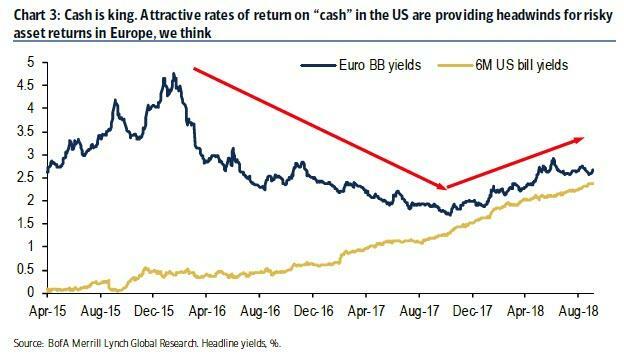 If that is the case, yields will only drift wider as US cash rates become even more attractive as 3M USD Libor is increasing again, and the Fed will likely hike rates at least another 3 rate hikes by the end of ‘19, to the detriment of the European high-yield market. corners of the market, Martin believes that there will be even more headwinds to Euro spreads. Chart 4 shows the implied impact of blowing out Italian yields on European junk, while Chart 5 shows that Euro HY spreads have had a reasonably high correlation to EM FX volatility over the last few years (BofA's strategist also notes that the recent jump in the US Dollar will likely lead to another round of EM currency weakness shortly). The European economic slowdown has been broad based and for a variety of reasons. The decline in global trade has crimped the German recovery, for instance. Yet the rise in the oil price has slowed French economic momentum (France is a more closed economy than Germany, so consumer spending has suffered). orders index fell to 50.2 in Europe, the lowest since Oct ’14). Aside from rate differentials and fundamental economic considerations there also positional drivers behind the recent move. Case in point, retail outflows remain an important reason why Euro credit markets have been exhibiting greater signs of “fragility” since Q2 this year according to BofA which again notes that "attractive “cash” yields in the US are hindering the return of retail inflows into European assets (not just credit)." Perhaps it is the sharp rise in US cash yields that explain why year-to-date, Euro-domiciled HY funds have experienced "a painful $33bn of outflows (12% of assets)." Compared to high-grade, though, the good news in high-yield is that the outflow story looks to be past its peak (and recent weeks have seen a tentative return of some retail inflows). 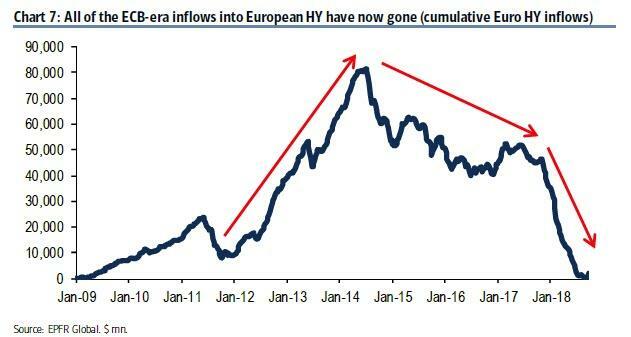 As the next chart shows, the inflows into European HY witnessed in the “ECB era” (2012 onwards) have now been withdrawn. Yet any celebration that the outflows are ending may be premature if the EM FX rout makes a dramatic return, due to the "demand-sapping effect of EM volatility on European high-yield." Chart 9 in particular shows the high correlation between EM FX vol and fund flows into European high-yield markets. We believe a period of US Dollar strength would be most bullish for signalling the return of Euro credit inflows. Finally, since the report was authored by the same analyst who back in June issued a loud warning about the dangers of roughly €800 billion in BBB-rate bonds which will likely be downgraded to junk during the next Eurozone recession, i.e. 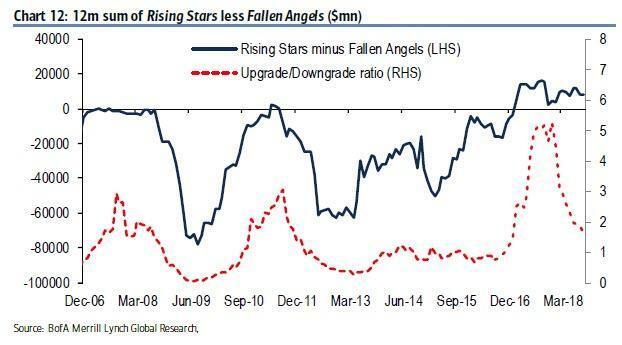 nearly $1 trillion in potential fallen angels, in his latest report Martin updates of European high-yield fundamentals, which tracks leverage, coverage ratios, earnings and debt levels across BBs and single-Bs. Putting these observations together, it is becoming increasingly clear that the European junk bond bubble popped some months ago, and is currently deflating at an accelerating pace, prompted by Euro-specific factors such as Italian political and budget instability, rising cash differentials with the US, concerns about the end of the ECB's QE, EM contagion and an overall slowing Eurozone economy. Perhaps the only question is how long before Europe's credit weakness contagion jumps the Atlantic and a similar set of adverse factors materializes in the US, where the junk bond bubble remains impervious to virtually everything that has been thrown at it.